RAF229..... S.G.Brown Air Ministry (Royal Air Force) REF 1969 Flameproof key with its own Spark Gap ! circa about 1910. (See Morsum Magnificat magazine MM25). This fine key has the serial number 229 stamped in two places on the main frame. A highly collectable and rare key. The Royal Air Force was formed in 1918. RAF229..... To the right is a view of the internal layout. One set of main contacts at the front and two sets of auxilliary contacts at the back, plus adjustable spark-gap on the top of the key. RAF229..... On the left is a closeup of the spark gap. The spark could be viewed through the round mica disc in the top of the cover.The use of this type of key remains rather a mystery. Probably for airship use by the RAF c1910 on. Malcolm / G4YMB adds this interesting information: "I puzzled for ages about the spark indicator and eventually an old timer came up with an explanation that was feasible. He said that the spark indicator was on a seperate circuit to the key and was actually connected to the aerial.The reason for this was that these keys were indeed used in balloons at some stage. The balloons were hydrogen filled and the purpose of the spark indicator was to detect the presence of static electricity, lightning etc. because they don,t mix so well with the hydrogen! He also said that they were used in some aircraft with the same set up for the same purpose. When you look at the connections on the key this does look plausible". "Malcolm G4YMB". 045..... A French DYNA Aircraft key. Reputed to be from a Caravelle aircraft that first went into service in 1955. 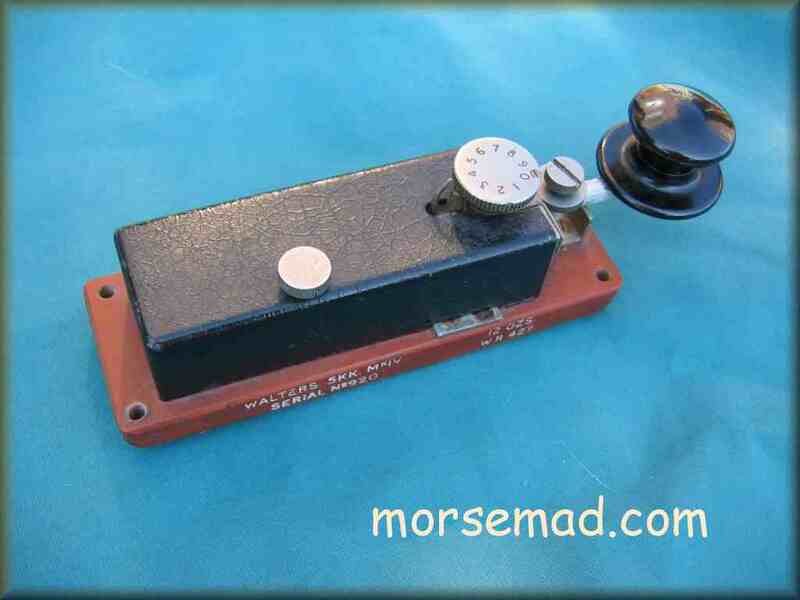 Wyn Davies informed me: "Manitones morse code keys, there were four models - 29414T, 29416T, 29427T and 29418T". 046..... A French SAREM key . Circa 1930's. Used with transmitter-receiver types 3-11 & 3-12C. (See MM29 page 25). The following info courtesy of Herman / VK2IXV... "The French company S.A.R.A.M (Societe Anonyme, or Limited Company, of Radioelectric Applications to Aeronautics and Marine) was the designer of radio and electronics equipment manufactured under license by the following companies in France: S.I.P.L. (Industrial Company of Processes Loth) (S.I. = Societe Industriel) - BRONZAVIA S.A - OMERA ( company of Optics Mechanics Electricity and Radio). S.I.P.L. 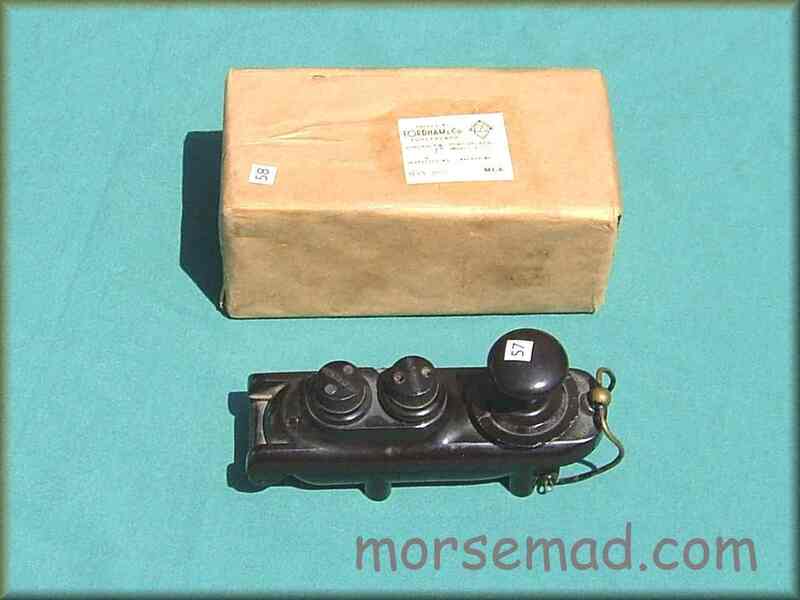 manufactured 3-10 & 3-11 radio sets and Morse keys in their workshops in Planquivon from 1938 to the end of WW2, that were originally intended for use in bombers. The equipment was in fact used by the German Army and Luftwaffe extensively throughout WW2. From 1948 into the 1950s, Bronzavia SA. in Courbevoie, also built the radio sets and keys under license as did Omera in the 1950s and 1960s. The radio sets and keys have also been used on Caravelle aircraft in the late 1950s and 1960s. Early keys were painted grey, and later in the 1960s, they were painted black crackle. (It is possible that the design of the keys goes back to about 1936 as someone has reported them being used for the 1936 Scout Jamboree of the Air (JOTA)". 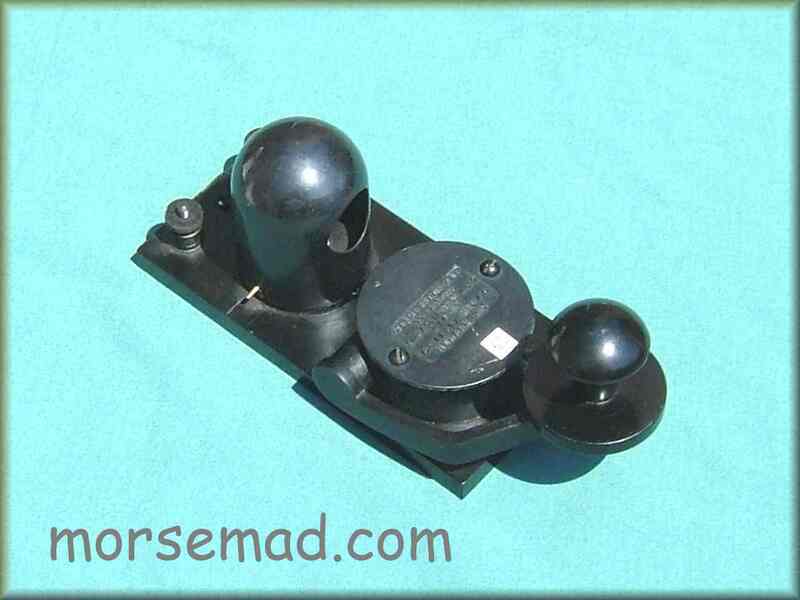 060..... American J-7 Aircraft key dated 1921, with winker light aimed back at the operator. A rare key. 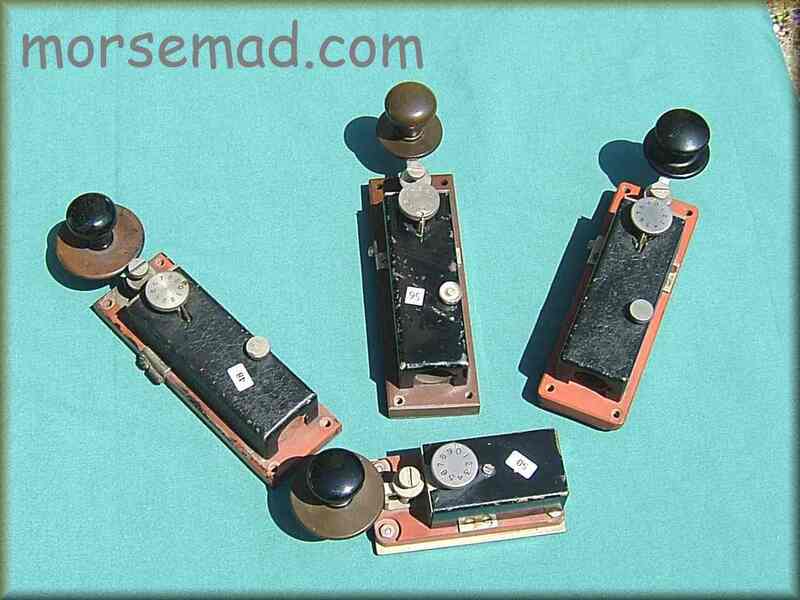 "These keys were made from 1918 through 1945 by L.S.Brach in Newark, NJ, and manufactured by General Radio Corp. As for J7 and J-7-A Aircraft Keys with a Winker Lamp, a radioman could see if his transmittion was on the air - the lamp had weak inductive connection with the antenna. 73 UA3AO". 057-58..... Two RAF Type F Aircraft Keys. Commonly known as the Bathtub Key. One on display and one still in it's sealed box - Never Opened! These flameproof keys were used by the RAF in several aicraft - notably the Lancaster bombers of WW2. Stop Press! I have just (June 2007) removed the key from its packaging dated May 1952. There was Brown paper outer / black tarry substance next / stiff cardboard box / brown corregated packing / the actual key in grease proof paper. What a packing job! One label on the inner box reads: "Packed By FORDHAM & Co. SUNDERLAND. Contract No. CONS/STORES/19221/C. 6 (c). MAY 1952". 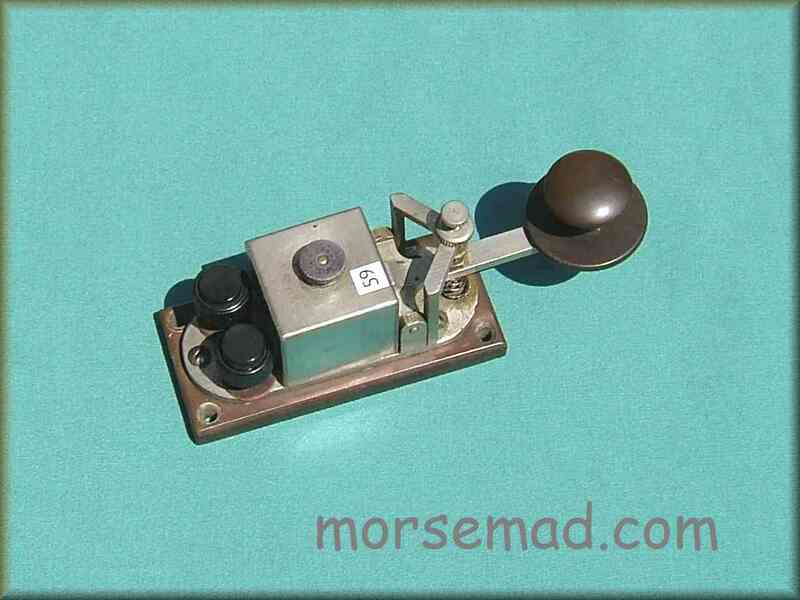 Another label reads: "10F/7741 KEYS MORSE TYPE F QTY. 1"
047..... A piece of aviation history! A British Walters Key Type 5 KK Mk4 Serial No. 920. This actual key was fitted to the first jet airliner - construction No. G51 - the de Havilland Aircraft Co's prototype DH106 Comet "G-ALVG" belonging to BOAC (British Overseas Airways Corporation), first flight flown by Cunningham, Hatfield on the 27th July 1949. (See Morsum Magnificat magazine MM20, page 10). 047B..... To the right is a page from FLIGHT magazine 1952. 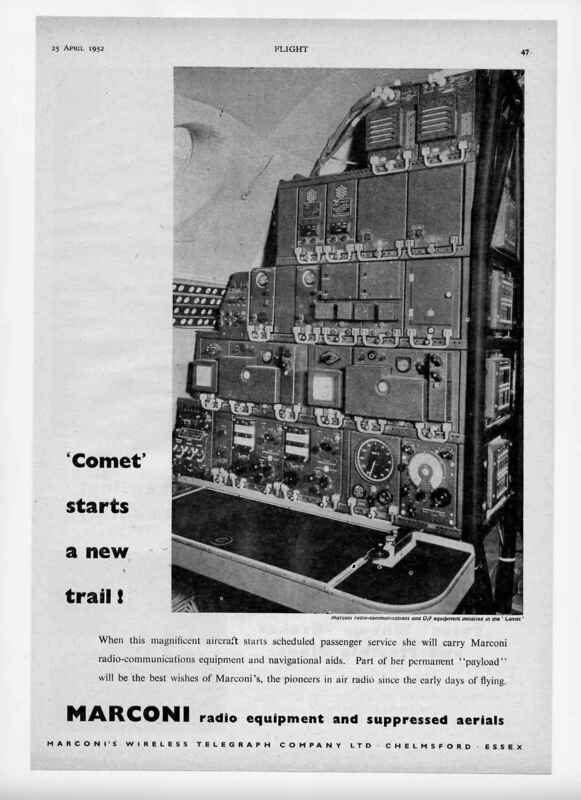 "Marconi radio-communications and D/F equipment installed in the Comet". The key can be seen bottom right, on the operating table. 047C..... On the left is a photograph of this very jet airliner. 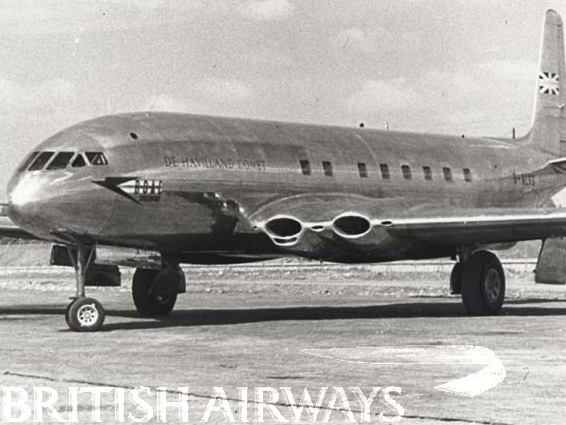 The De Havilland Comet Prototype G-ALVG. This web site provides lots of info: BA MUSEUM. 048-50-56..... A nice collection of keys. A Walters Type 5KK MkIV, two others and a smaller version in the model 7024. (See Morsum Magnificat magazine MM34, page 11). 149..... 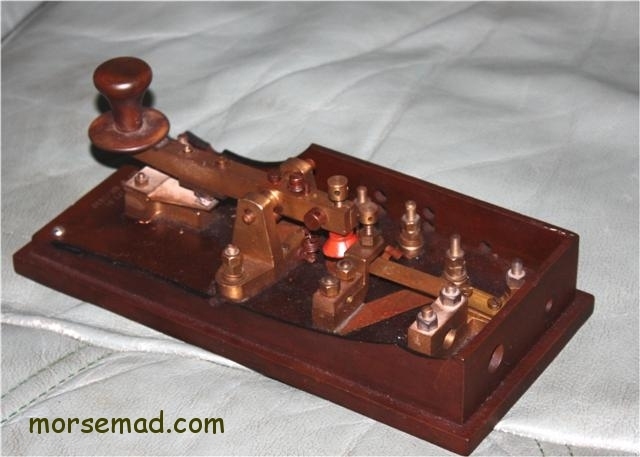 The classic MARCONI Air Ministry (A.M.) "D Type" Key. Designated 10F/7373. 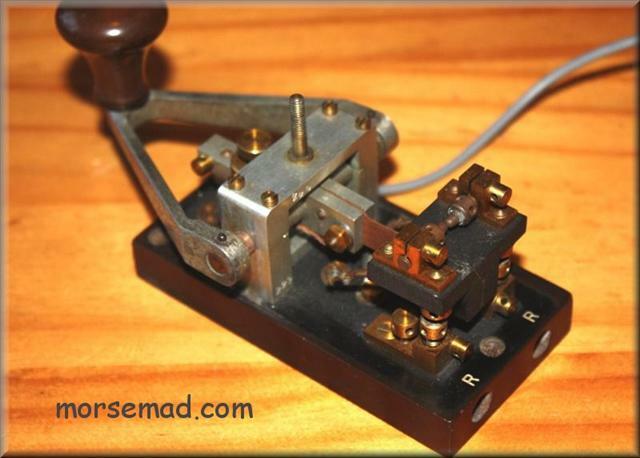 A fine big ground station key with large contacts. 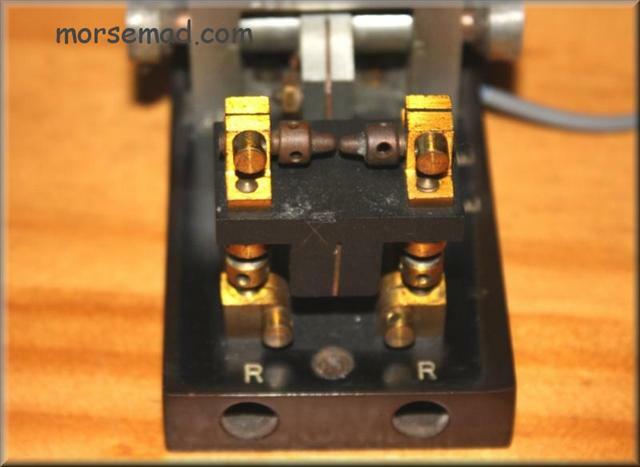 Perhaps one of the most under valued keys in the collecting world, a magnificent morse key on a par with the Marconi Marine keys of the same era. 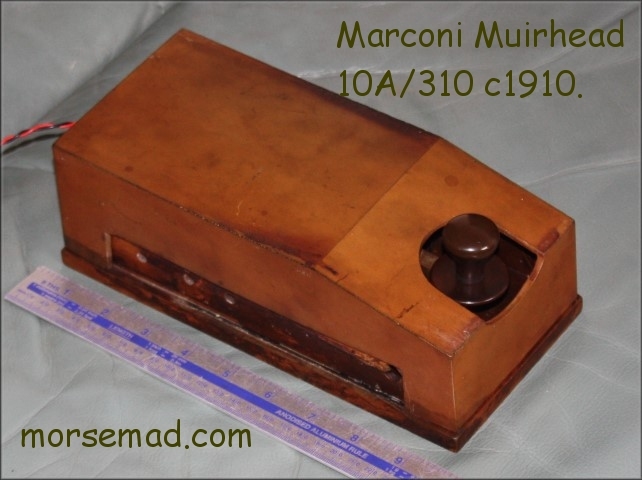 Early versions (very rare) have "MARCONI'S WIRELESS TELEGRAPH Co. Ltd. No xxxxx LONDON" inscribed on the base, circa 1910, later ones have unmarked bases. These keys usually have damage to the bakelite cover, so un-damaged, great condition ones are worth their weight in gold (Well - not quite). 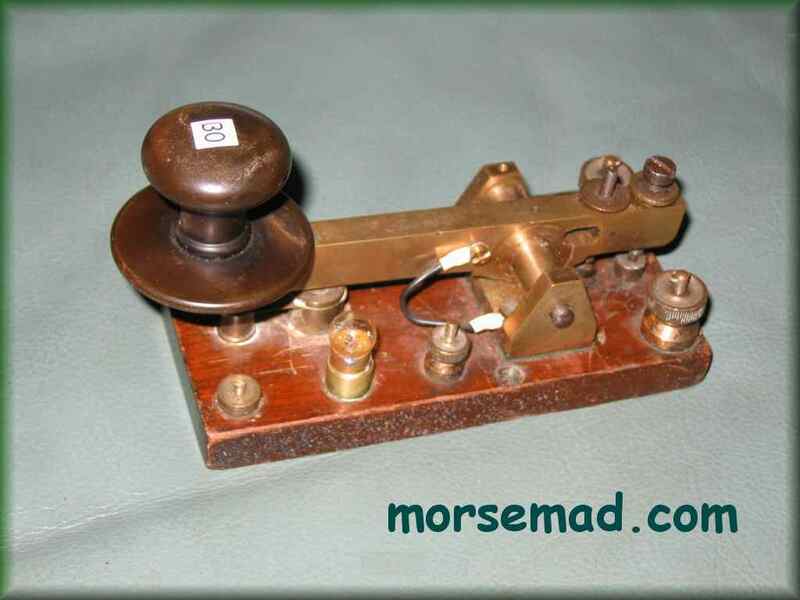 149b..... An early and rare MARCONI A.M. "D Type" Key inscribed "MARCONI'S WIRELESS TELEGRAPH Co Ltd. No 58762 LONDON". The number is not a serial number, but a production number. So this could give a clue as to the date manufactured. 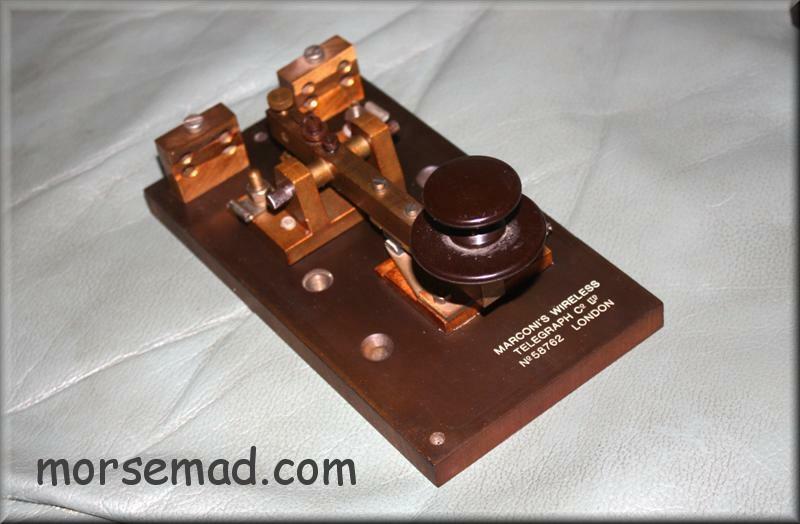 Do you have one of these keys with the Marconi markings ? If so - please let me know. 059.... .... RAF Aircraft Key Type AM-10F/94 circa 1910. Marconi made. On the metal base is the Marconi model number P.S. 5785A. 062. 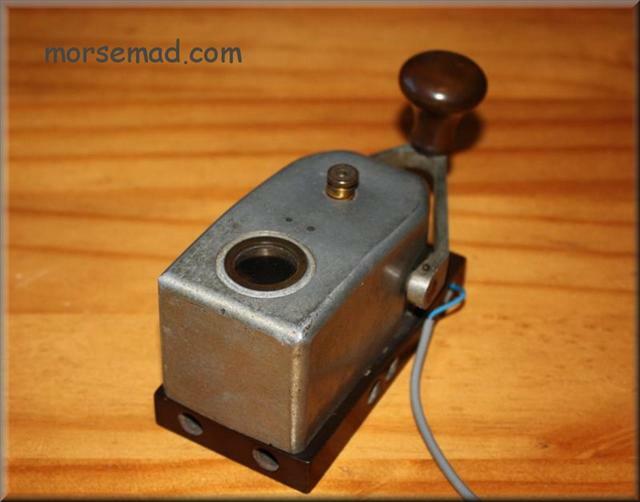 ....Air Ministry (later RAF) Switch Box Identification. Type B 5c/372. As fitted on many aircraft circa 1910. Notably fitted to Hurricanes and the Spitfire Fighter Aircraft during WW2 1940's. 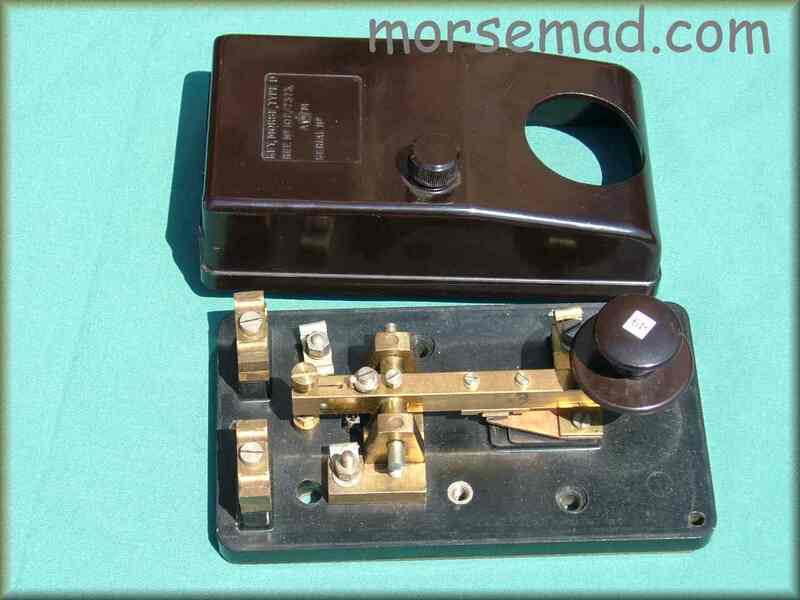 130..... British Brass RAF Morse Key. Type RAF No.1 Key. Circa 1918. Note the extra two smaller terminals and a bulb holder with bulb. 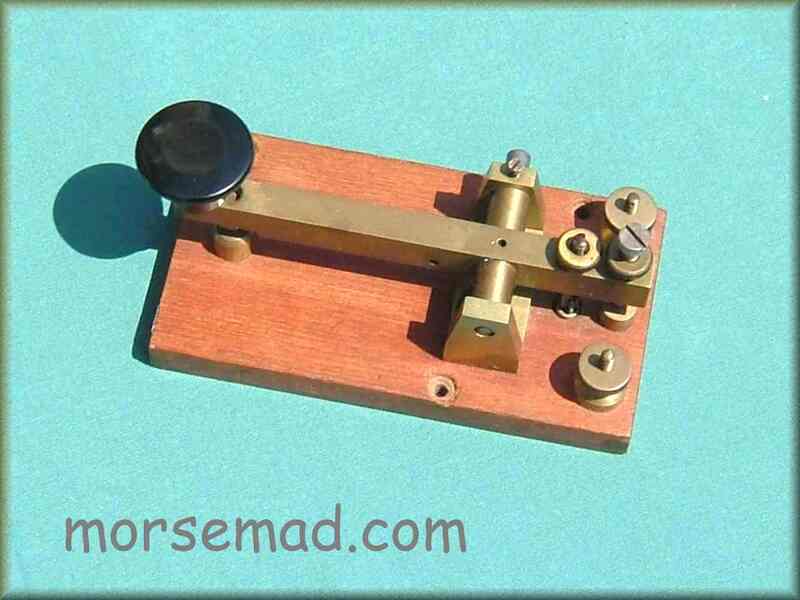 147..... British Key Air Ministry Marconi Type B1 REF No 10F/7839 huge spark key in brass and bakelite circa 1910. Originally would have been fitted with a bakelite cover. Overall dimensions are 9 1/2" long by 4 1/2" wide and 3 1/2" high (243mm x 114mm x 89mm). Big silver (?) contacts on a springy plate just like the "D Type key. Used to key large spark transmitters. The earlier Type "B" had a brass cover. 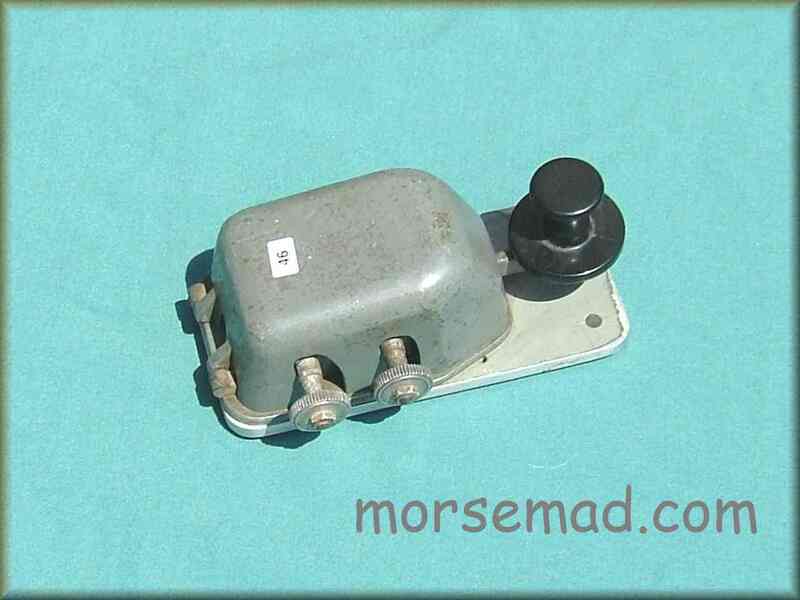 147B..... Air Ministry Base Station Marconi Type B1 REF No 10A/310 spark key with bakelite cover. c 1910. 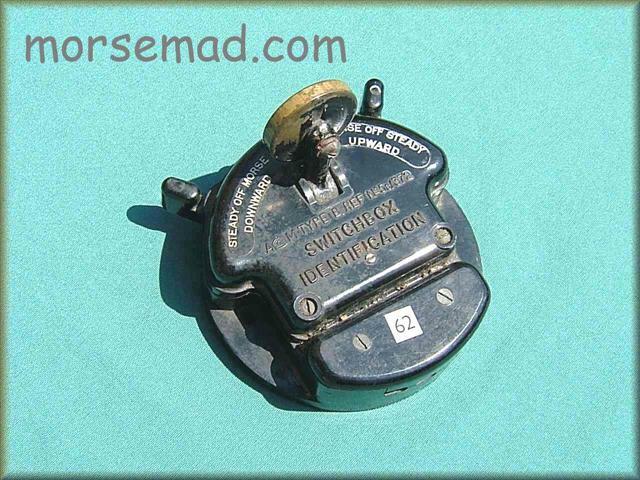 Used with spark transmitters. This example was manufactured for Marconi by Muirhead & Co Ltd.. No 63843. Ref No 10A/310. 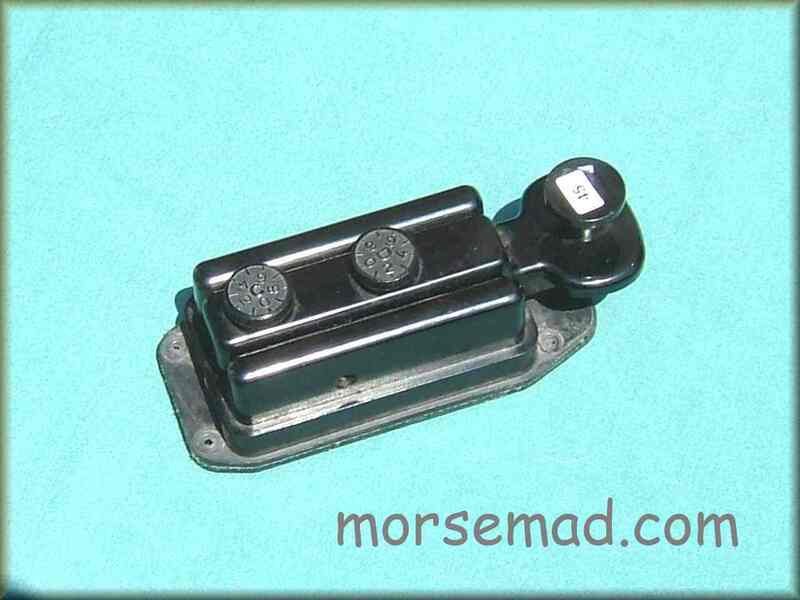 Bakelite covers for these big spark keys rarely survive the many years of use. 109..... British Brass Key. Marked RAF 2533 (designation 10F/2533) circa 1918. Wyn Davies provides this info: "Once sold as WW I surplus by Dixon's of London. Some were plated brass with designation 10F/2533 and the RCAF had the exact key with a different knob designated 10A/556. 124..... Michael / ZL3AX sent me this interesting photo of a key in his collection. 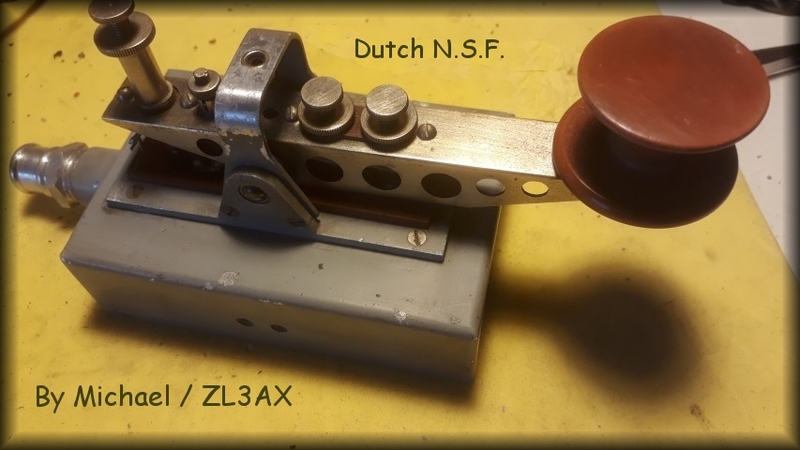 A Dutch key made by N.S.F. Nederlandsche Seintoestellen Fabriek. (Dutch signal equipment factory). Info thanks to Jan / PA3EGH.